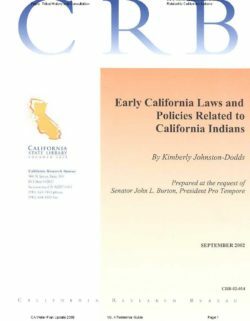 The objective of this guidance document is to convey information, as provided by California’s Tribal governments, by which local agencies can engage Tribal governments as part of an effort to identify interested persons, and consider the interests of beneficial users of groundwater; including those users on Tribal lands not subject to the Sustainable Groundwater Management Act (SGMA). 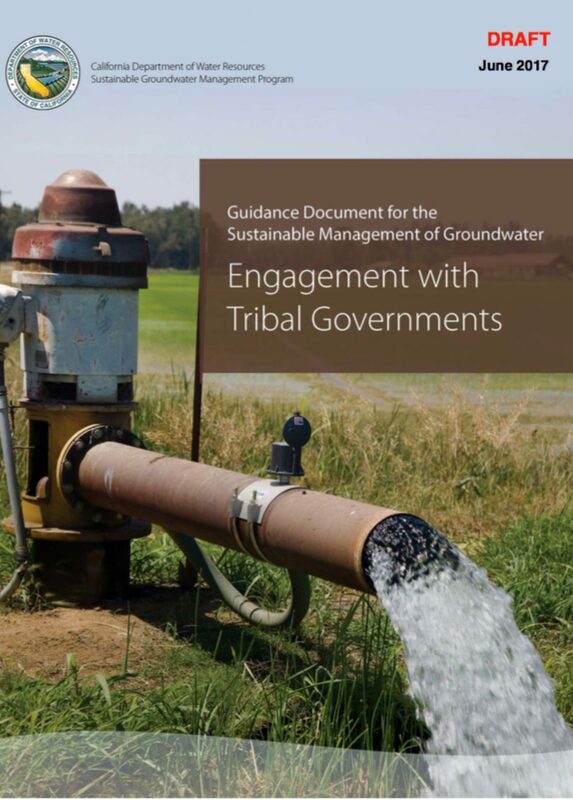 This guidance document can also be used to help local agencies engage with a Tribal government in the planning, financing, and management of a Groundwater Sustainability Agency (GSA), or help with the development and implementation of a Groundwater Sustainability Plan (GSP) pursuant to SGMA. 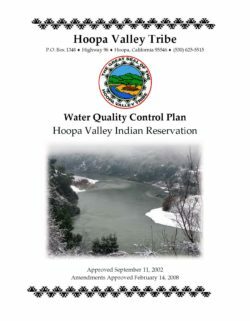 The Hoopa Valley Tribal Council pursuant to Title 37 of the Hoopa Tribal Code has assigned the primary responsibility for the protection and enhancement of water quality on the Hoopa Valley Indian Reservation to the Riparian Review Committee (RRC). The RRC along with the Hoopa Valley Tribal Environmental Protection Agency provides Reservation-wide coordination of the water quality control program by developing, reviewing and recommending for Tribal approval Reservation wide policies and plans for the implementation of Tribal and Federal law. This Water Quality Control Plan recognizes the unique characteristics of each watershed with regard to natural water quality, existing, potential, and historical beneficial uses, and water quality problems. The goal of this plan is to provide a definitive program of actions designed to preserve and enhance water quality on the Reservation, and to protect the beneficial uses of water for the next 10 years to 20 years. The plan is concerned with all factors and activities that might affect water quality. However, the plan emphasizes actions to be taken by the Riparian Review Committee, the Hoopa Valley Tribal Fisheries, Forestry, Public Utility Departments, and Tribal Environmental Protection Agency, as they have responsibility for maintaining water quality on the Reservation. The Water Quality Control Plan (WQCP) is comprehensive in scope. 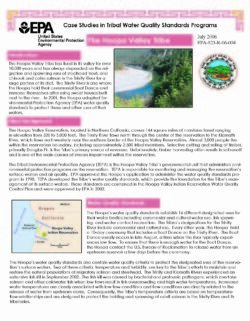 The WQCP describes the Hoopa Valley Reservation waters, the quality and quantity issues, and the existing, potential and historical beneficial uses of the Reservation’s waters. The plan also prescribes criteria for the protection of the Reservation waters and includes plans and policies that describe the basis for the management of water quality and protection of human health. The Hoopa Valley Tribe has recognized authority for setting water quality standards for its Reservation waters, including both the Trinity and Klamath Rivers (U.S. EPA, 2002). Included in the plan are specific criteria that apply to the Lower Klamath River on the Hoopa Valley Reservation (Figure 1.1). Manual Section 1780 (MS-1780) and Handbook 1780-1 (H-1780-1) are being released simultaneously . 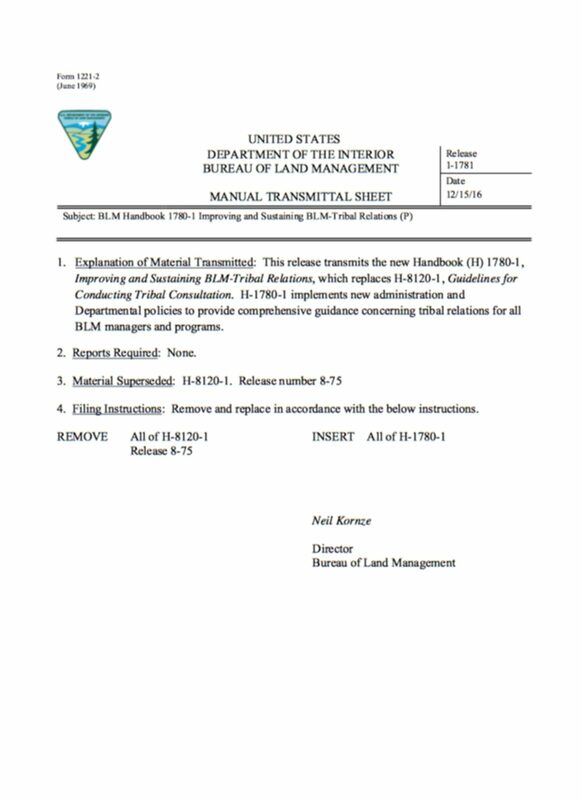 H-1780-1 , I mproving and Sustaining BLM- Tribal Relations, replaces H-8120-1 (Rel. 8-75, 12/03/04) . 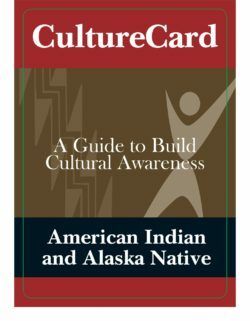 M S - 1780 , Tribal Relations, replaces MS-8120 (Rel. 8-74, 12/03/04). MS-8 120 and H-8120 - 1 were specific to implementation of historic preservation authorities only . 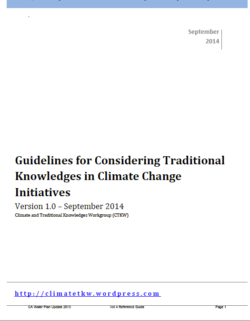 Therefore, this new guidance is appropriately placed within the Bureau of Land Management (BLM) 1700 series, which addresses relations with other governments, including State, local, and international relations . Developed in response to the finalization of 512 Departmental M anual (DM) Chapters 4 and 5, H-1780-1 with MS-1780 provides direction for all BLM programs for improving and sustaining tribal relations , including government-to-government consultation. 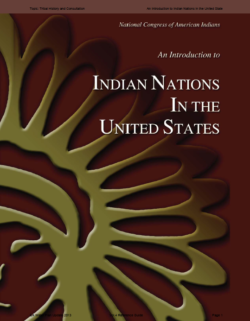 We attempted to be inclusive; however, this handbook does not contain sections for every program area or discipline who should be involved in tribal relations. Updates and additional chapters will be added when they are available. Severe drought in 2001 affected the Klamath River Basin, an area on the California-Oregon border, exacerbating competition for scarce water resources and generating conflict among several interests – farmers, municipal and industrial users, commercial and sport fishermen, other recreationists, federal wildlife refuges, environmental groups, and Indian Tribes. The conflicts over water distribution and allocation are physically and legally complex, reflecting the varied and sometimes competing uses of limited water supplies in the Upper Basin. On April 6, 2001, the Bureau of Reclamation (Bureau), which has supplied water to farms in the Upper Basin for nearly 100 years, announced that “no water [would] be available” for farms normally receiving water from the Upper Klamath Lake, so that scarce water could be used to protect species listed as endangered or threatened under the Endangered Species Act (ESA). Water was available to some farmers from other sources (e.g., wells and other Bureau sources); however, many farmers were not able to plant or harvest crops due to severe cutbacks in water supplies. Emotions ran high on all sides of the issues, and the water control gates were unlawfully opened by protesters. Although the Basin has received significantly more precipitation in 2002, many issues remain in dispute. In addition, several judicial decisions have affected the issues with respect to the listed species as well as tribal rights. On May 31, 2002, the U.S. 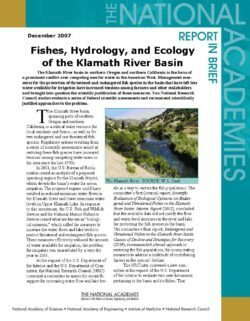 Fish and Wildlife Service and the National Marine Fisheries Service both issued Final Biological Opinions on the Bureau’s 10-year Operation Plan for the Klamath Project. The agencies found that the Bureau’s proposed action is likely to jeopardize the continued existence of the two listed suckers and coho salmon, as well as result in the adverse modification of proposed critical habitat; however, both Opinions also included “reasonable and prudent alternatives” for operating the Project that would remove the jeopardizing effects of the proposed action. However, on June 3, 2002, the Bureau formally rejected both Final Biological Opinions, but opted instead to operate under a one-year plan that it asserts complies with the Opinions. Independently, in March 2002, the President appointed a high-level working group to develop solutions. Congress has responded to the controversy in a number of ways, including holding several oversight hearings and appropriating funds for water conservation activities in the area. This report provides background on the geographic, historic, and legal underpinnings of the current conflicts. 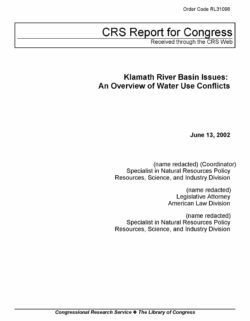 Because the report focuses on the current conflicts, it deals primarily with Klamath Project operations in the Upper Klamath Basin and effects associated with water releases from Upper Klamath Lake.